Contains two luxury handmade creamers made with pure Lemon Essential Oil and lashings of Shea Butter and Cocoa Butter. 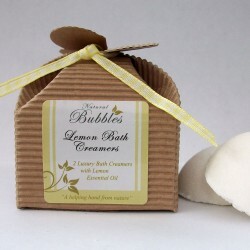 Lemon has an uplifting and lively aroma and is great for blemishes and oily skin. Shea Butter and Cocoa Butter moisturise the skin. You will certainly notice the difference after this bath time treat! Directions: Place one creamer into warm water and allow to melt. Sodium Bicarbonate, Citric Acid, Zea Mays Starch, Butyrospermum Parkii, Theobroma Cacao, Citrus Aurantium Dulcis, Citral, Limonene, Linalool. We all need a little ‘me’ time, and what could be more perfect than Natural Bubbles luxury bath products. Each product will fill the room with a wonderful natural aroma that freshens the mind, body and soul. Eco friendly packaged. All fully recyclable. Natural Bubbles use no chemicals that can irritate the skin.